Why do millions of people all around the globe shop QVC every day? Because we offer a highly engaging, highly differentiated shopping experience. We strive to surprise and delight our customers every day, with curated collections of products that are relevant to their lives. We connect with customers via authentic stories, interesting personalities and award-winning customer service. We invite customers to tell their stories and share their feedback. And we do it all live, across multiple networks and platforms. It’s how we deliver the joy of discovery through the power of relationships. Explore some quick facts about QVC. Our journey began in 1986 in West Chester, Pa., with a Windsor shower radio and a vision to create highly engaging shopping experiences. Our journey began in 1986 in West Chester, Pa., with a Windsor shower radio and a vision to create highly engaging shopping experiences. 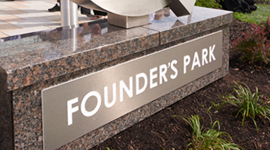 In addition to the West Chester Campus, comprised of Studio Park and Founder’s Park, QVC US has two domestic call centers in Texas and Virginia and five distribution centers in California, North Carolina, Pennsylvania, South Carolina and Virginia. In 1993, QVC UK became our first market outside of the US. And just four years later, QVC UK welcomed its 1 millionth customer. In 1993, QVC UK became our first market outside of the US. 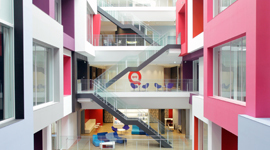 And just four years later, QVC UK welcomed its 1 millionth customer. Today, our community of shoppers is stronger than ever. 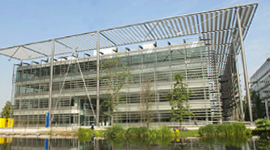 QVC UK has its broadcasting and administrative operations in Chiswick, London, and an operations, distribution and call center facility in Knowsley (approximately 200 miles from London). We expanded QVC into Germany in 1996. And more than 20 years later, QVC Germany continues to attract a large, loyal customer base. We expanded QVC into Germany in 1996. And more than 20 years later, QVC Germany continues to attract a large, loyal customer base. 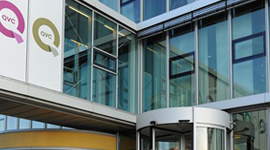 QVC Germany has a distribution center in Hückelhoven and call centers in Bochum and Kassel. You’ll find QVC Japan headquartered in Makuhari, Chiba, about 25 miles outside of Tokyo. You’ll find QVC Japan headquartered in Makuhari, Chiba, about 25 miles outside of Tokyo. Our iconic seven-story building features green technologies and contemporary work spaces designed to foster cross-team collaboration. QVC Japan also has distribution facilities in Sakura. Approximately nine miles from Milan, the city of Brugherio hosts QVC Italy’s broadcast studios, administrative offices and call center. Approximately nine miles from Milan, the city of Brugherio hosts QVC Italy’s broadcast studios, administrative offices and call center. 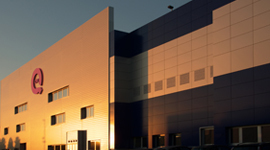 QVC Italy's distribution center is in Castel San Giovanni, also outside of Milan. In 2012, we formed a joint venture with Chinese National Radio (CNR) to bring QVC to to the world’s largest country. In 2012, we formed a joint venture with Chinese National Radio (CNR) to bring QVC to the world’s largest country. CNR Mall features television programming and an e-commerce site. 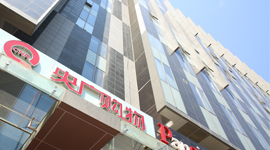 The broadcast operations, call center and distribution center are in Beijing, with two additional distribution centers in Nanjing and Changchun. QVC’s broadcast programming is made possible, in part, with the support of the Commonwealth of Pennsylvania and the Pennsylvania Film Office.